We hope you will enjoy our historical, Down East Maine bed and breakfast in Castine, Maine. 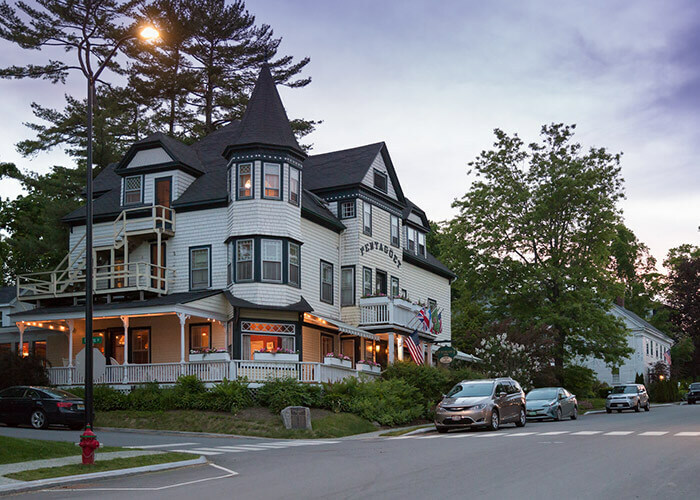 The Pentagöet Inn was built in 1894 and is Castine’s oldest, original “summer hotel” still welcoming guests of Penobscot Bay. We are very proud of our coastal Maine lodging. The town’s present serenity belies its turbulent past. Founded in 1613 as a French trading colony, the village later evolved into the first permanent settlement in New England. The Dutch, French, English, and Americans all fought for a foothold on this lush peninsula. It wasn’t until the late 1800s that Castine was able to settle down and prosper. Born of a deep-water harbor with a shipbuilding past and East India trade, it became the second wealthiest port in America. The legacy of those days lies in the gracious architecture you’ll see throughout Castine today. Just take the scenic “Walking Tour of Castine,” a self-guided brochure that outlines more than 50 historical sites, museums, parks, and distinguished homes. Join us for a getaway in Maine to remember. 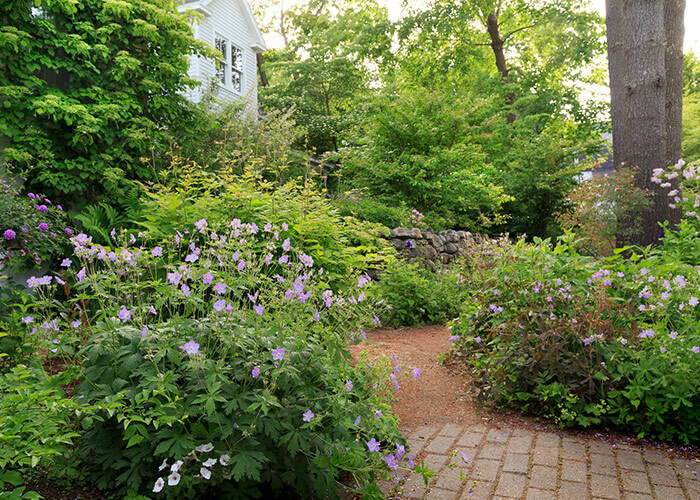 Begun in 2001, the woodland garden at the Pentagöet Inn features native shrubs and shade perennials with a long season of interest, something fragrant and blooming from February through November. From the garden’s inception we have been committed to organic gardening practices, using compost rather than chemicals. Some of the herbs and edible flowers that we grow are used for the restaurant. The garden is full of pollinators, birds, butterflies, even a few resident toads in our village setting. Native witch hazels bracket the garden’s activity. A collection of fritillarias extends the Spring bulb season into early summer, while an emphasis on foliage represented by traditional woodlanders, balances the high summer color of annuals in window boxes and container plantings. Native Cimicifuga (Actaea) racemosa buds in late summer, then flowers well into autumn with American delphiniums , perennial prairie petunias, and self-seeding gauras. Autumn crocuses and colchicums sparkle beneath the colorful foliage of native aronias and shadbush. 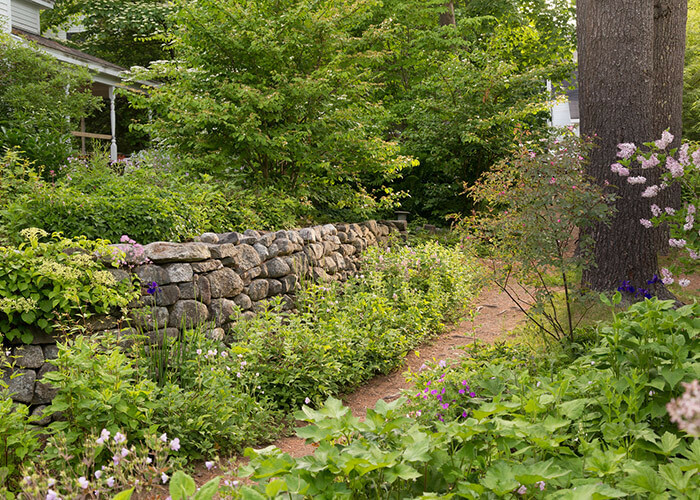 Stroll through our beautiful gardens to discover native perennials that flourish in the unique climate of coastal Maine. We hope you’ll visit; there is much to enjoy. Below are the directions to Pentagöet Inn, our lodging near Acadia National Park. 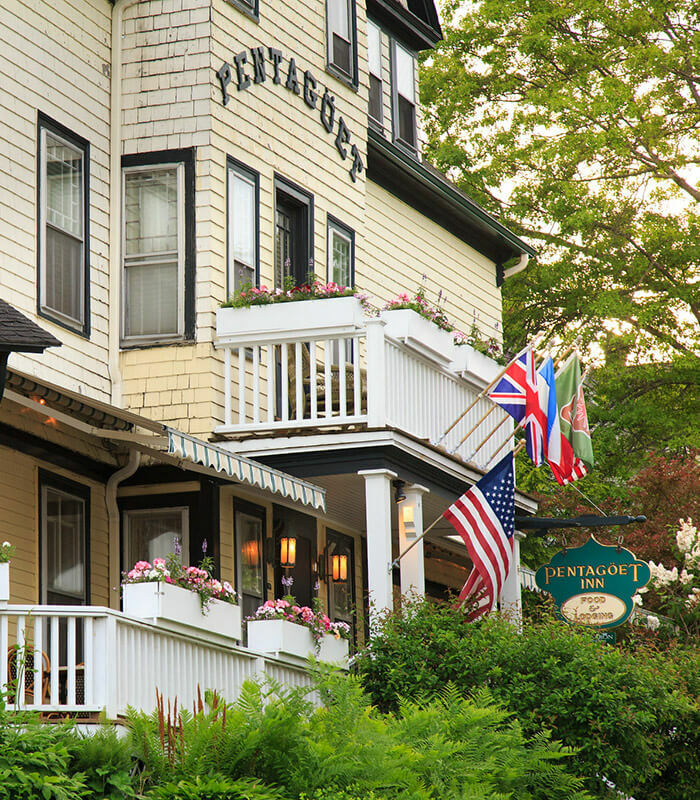 With so many area activities, many of them focusing on outdoor experiences, our Maine Coast bed and breakfast will beckon you back again and again.